I was shopping in the local supermarket this morning – not an unusual event in itself. I’ve written a little about it before. But, here’s the thing; I discovered another key difference between the sexes as I was shopping. Now that is valuable, you must agree. My favorite difference between the sexes was posited by 'my main man' James Thurber many tears ago (typo, what typo?). He suggested that the main difference between men and women was that men inspect their fingernails palms up with their fingers bent over while women do it palms down with their fingers outstretched. Who can argue with him, eh? Who? So now, today, I get my own theory and I’m not blowing my own trumpet when I suggest that it’s just a valid as James Thurber’s was all those tears ago (nope… ‘still don’t see any typos). Here’s mine, after a tiny bit of background. This morning, my lovely wife asked me to get some breadcrumbs in the supermarket. Doubtless these were for some new exotic culinary experiment. This was a new item on my list and I kind of hate that because I’ve got the shopping routine pretty much down pat (pat is an Irish guy) at this stage. I know what I need and I know where it can be found. Fine. But when something new comes on the list, I can lose time looking for it – I can lose a lot of time. I lost lots of time today... looking for breadcrumbs. I used all the limited logic at my disposal to find them too. “Breadcrumbs,” I mused, silently because out-loud-musing can get you into all kinds of trouble in the supermarket, “breadcrumbs will be in the baking section. So confident was I of this that I went there and simply reached out to the shelf, fully expecting them to be at the end of my arm. Next I figured they must be in the bread section – a moderate hike across the store. Nope, plenty of bread there, none of it in crumb form. I tried lots of other places. I even tried asking an employee but he wasn’t conscious. Eventually I gave up and I phoned my wife. She told me where the breadcrumbs were without a moment’s hesitation and she was dead right. I went there and there they were. "Women know where the breadcrumbs are, men don't." That's it, my Eureka moment for today. Had there been a bath available, I would have certainly jumped out of it. You guys want to know where the breadcrumbs are? Yes but if I tell you that, then the rule won’t work anymore, will it? The breadcrumbs are next to the chickens. I know, I can’t bloody figure it either! You use a photo of a sparrow in reference to crumbs...A woman would incorporate a chicken. I never have this problem. I always run the end of a loaf of bread through the cheesegrater. Voila! Breadcrumbs. Our breadcrumbs are located in the spices/ oils aisle. Oh, and I inspect my gnawed off fingernails like a man would. Now I'm in the midst of an identity crisis. Thanks Felmar. I once sent my bloke off with a list which included 'pots'(obviously...abbreviated potatoes...obvious to me anyway). He came back with potted spread (beef I think) - something I have not eaten since the 70s. Dominic: You are a tower of good sense. But if I had done that simple thing, then my discovery would not have been made and where would the world be then? Eh? Yo Yolander: This is tricky, what you say. Shall we just decide that you are the exception proving the rule and a spectacular individual in your own right regardless of gender or cuticle-examination-behaviour? Regarding your first point, the breadcrumbs may well be with the spices, in your shop, but you have to ask yourself this question: "Where are the chickens?" Am I perhaps getting too philosophical now? Count yourself lucky, Rachel. If you sent me for 'pots', you would get 'pots'. I am ofttimes complimented for my hyper-literal consummation of a shopping list. 1) I inspect my fingernails like a man. 2) Dried breadcrumbs in my local shops are with the salt and so on. Fresh breadcrumbs are, like yours, with the chickens - and they're there because breadcrumbs are used to make stuffing, of course. I prefer to make my own and freeze them. Darn it... when did I turn into a man??! I would of guessed near the soup cans ??? Crumbs kinda go with croutons no ? But yeah I looked at my fingernails with the palms up....I remember someone asking me with that test once. I may be an exception to this rule, though I am 25 and don't spend much time in grocery stores! I often have trouble finding what I need because they don't put things where I think they should logically go. For this reason, I have developed a dislike for supermarkets. Though now, I can aspire to one day become a breadcrumb woman. In the battle of the sexes the best a man can hope for is a 0-0 draw. If you'd been our grocery store, the breadcrumbs would have been in the bread aisle, along with croutons. Yes, here bread groups itself together into its infinitely smaller forms-- from full bread, to cubes to the crumb. Chickens??? Do we only crumb a chicken? Why, no. This is no guy-failing. This is poor breadcrumb strategy. No wonder you were confused...no grocer picks the same spot. ;) Ours are on the aisle with the flour, right next to the stuffing mix. I once encountered an elderly gentleman who, after clearing his throat several times to no avail, turned to the stock boy and asked, "Where are the potato buds?" The kid pretended he didn't speak English and shrugged. The man tried again, "My wife says you have them." The stock boy walked away as if the man were a leper. I feel sorry for guys in the grocery store...it's like sending a woman to a mechanic. And, as a short woman, more than once I've had to swallow my pride and ask for someone to grab something off a top shelf for me. So I smiled at this man and said, "Sir, they're on the shelf behind you." He turned around and stared at a box of instant mash potatoes as if I were nuts. With a grin I asked, "Is she making home made rolls?" You would've thought I'd offered him a million dollars. He thus became my friend all the way to the cash register...because had I not led him there, I never would've finished shopping. See, if you're just kind to the confused [or short] shopping doesn't have to be so painful. A good end to my tiring day. Have a blessed night. Cheers. I suppose the location of bread crumbs is something that's perhaps regional in nature. And then again, what's used in stuffing is usually much larger than what I would consider CRUMBS (and is referred to on the packaging as 'cubes"). The actual bread CRUMBS are located with the flour and other baking goods in my local groceries. Wow. LOL I love how you didn't reveal where the breadcrumbs actually were (I realise this was done with purpose). A pleasant reading. I am amused by the observation of James Thurber; it never occurred to me that there is a different between men and women in inspecting their fingers. I would say it is as close as a truth except there are always some exceptions from what we could read in some of the comments. I am a man, certified by James's observation, as I had just inspected my fingernails palms up with my fingers bent over this morning. Uhh, excuse me Margaret, stop sucking up please! You're supposed to unite with me, Chicken! I almost hate to admit this, but I'm a category manager for a grocery store chain in the United States and one of my categories is, you guessed it, breadcrumbs. Here's the thing with breadcrumbs....we don't even know where to put them! Should they go near the stuff you bread or near the product from which they are made. In our chain, they are in the bread aisle. And you are right, the women know that! Ken, I had this same problem recently with croutons. If you ever locate their section, send me a PM or something. Hi Catherine: This is tricky, what you say. Shall we just decide that you are the exception proving the rule and a spectacular individual in your own right regardless of gender or cuticle-examination-behaviour? And you are the only one who has explained to me why breadcrumbs are with chickens and now it makes sense... sort of. Hi Alan, it's the least 'rude' test I know - remind me to discuss the 'squeeze my finger' test sometime - now 'that's embarrassing! Erin: you *shall*, one day, be breadcrumb woman, I can feel it. Hi Jenn: 'Poor breadcrumb strategy', Ha!, I feel I may hear this again on CNN later. Hope: I *am* the confused, if you see me, be kind. 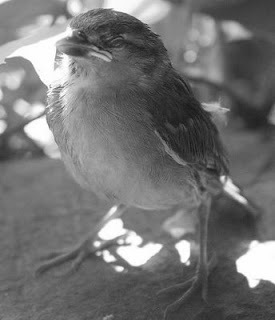 Hi Margaret: I think he is a tough and resilient looking little birdie - he will not stop until he finds crumbs. Cecelia: 'Unite with me Chicken' isn't that a hymn? Wow Reese, professional input - now I'm impressed. Want a coffee or anything... while you're here? LOL You so did NOT!!! Don't try and trick me, I'm on to you - you paddy! Don't be too impressed, Ken. I can assure you that while struggling through undergrad and graduate school, I never thought, "hmmmm, I'd like to sell canned peas for a living." And a coffee would be lovely, thanks. I need it! dear fragileheart, check the 2nd sentence from the end of the story and there you will find what Ken discovered. This may be giving away too many secrets, but where I shop, the croutons are next to the salad dressing. Then again the local grocer is getting clever and has also added some in the produce section, next to the lettuce. Nope, my question was when faced with a similar situation: why don't you take a slice of bread and crumble it up? Thankfully since then I've got my 'honorary woman's certificate' and don't make mistakes like that anymore. Damn you! I read this entire post wondering what she was going to make for dinner using the breadcrumbs! A writer has a story to tell; while a reader just wants to know what's for dinner. Hope, why did the lettuce blush? You don't remember the joke now, do you? Why did the lettuce blush? You know that us queers have to take classes in fashion, design, decorating, shopping, musicals, and relationship counseling before we get our Gay Cards. To your breadcrumbs... Here's something that will chip your cookies. Everything is seasonal! Depending on what holiday and the weather depends on where the stores put things. We all get it. They put things in places where we can get to them easy depending on what else we are gonna be looking for. The big diff I see between guys and dolls is... The crap they do for beauty. Why do they shave their legs just to put on stalkings and hose? Guys would never go through the pain of primping. Hope: wasn't that a horror movie, "Have you checked the chicken?" Over here, the breadcrumbs are above the packaged loaves of bread, next to the "Shake and Bake".